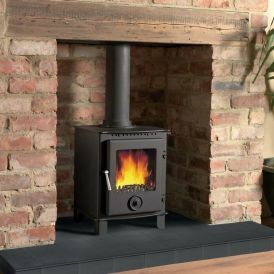 The Firemaster 5 is a 5 Kw wood burning or smokeless fuels stove with a smokeless option. Had two of these for 8 years and the are brilliant. Easy to clean, look good and produce great heat. Stove expert replied: Short and to the point. Great comments. Stove expert replied: Multifuel stoves do give the option of burning smokeless fuels and wood to suit different needs depending on your requirements. If you are having to buy fuel it is worth pricing each to see which gives better value and performance. Stove expert replied: Try leaving a small bed of ash to protect the grate from direct heat, do remove any from ash pan frequently to prevent the grate from being heated from both sides. Only riddle the stove until you start to see red embers in the ash pan. Stove expert replied: No manufacturer covers glass under warranty, it is a shame that you're rating the stove on this. It is like buying a car and 4 months later the windscreen cracks, there may be no obvious reason that can be found for this this and understandably it is very disappointing. Warranties do not also cover liners and other consumable parts.